The metal lath/scratch coat method of preparing a surface for masonry has traditionally been the go-to for many installers. Recently, however, manufacturers have been developing complete wall solutions using cement board. For many applications, these engineered wall systems are faster, easier, and cleaner than traditional lath methods. As with any process, there are benefits as well as drawbacks to introducing cement board to the building envelope as part of a thin brick or stone veneer design. Below, we explore the pros and cons of three of these exterior cement board wall systems using the PermaBase product from our partners at National Gypsum Company. CBMV offers a complete solution for installation of adhered veneers in residential and low-rise commercial applications. For exteriors, CBMV allows the installer to incorporate a water-management system with manufactured or natural stone and thin brick veneers. As with CBMV, CBSS is ideal for residential and low-rise commercial applications. CBSS provides a drainage system to help prevent water from penetrating behind cladding in framed construction. It complies with ASTM D 226, protecting approved sheathings and structural components and helping to evacuate incidental water. 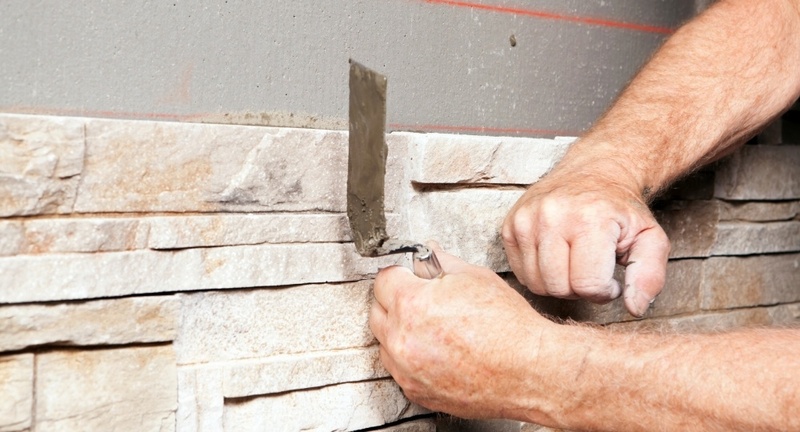 Minor cracking at joints may become visible in finished exterior surfaces. Continuous insulation offers a complete engineered solution for required structural performance. Including PermaBase as a component in this system reinforces the building and provides the ability to incorporate an effective water-management system. There are some basic code requirements when installing movement joints designed to accommodate the expansion and contraction of long walls. Such vertical movement joints are typically spaced at maximum 20' - 25' O.C. horizontally, at interior corners, at changes in wall plane, and where thin stone contacts different materials or wall systems. The Masonry Code for thin adhered veneer, Par. 12.3.2.2 states: "Wall area limitations - Height, length and area of adhered masonry veneer shall not be limited EXCEPT as required to control restrained differential movement stresses between veneer and backing." The movement joint is simply an uninterrupted, empty, vertical joint (3/8" wide) filled with backer rod and sealant. These pros and cons are a great guide to get started, but specifications and details on how to design and construct individual systems should be obtained from the adhering material or veneer manufacturer. For more information on incorporating PermaBase into exterior cement board wall systems, visit permabase.com/exteriors or contact us at Trowel Trades Supply.